It’s definitely not patio weather today in Nova Scotia. It’s pouring rain outside. So one can only dream of the warm sunny weather that we (hopefully) soon have. And one must be prepared. What better way than to start collection recipes for your outdoor fêtes? This one’s a keeper – and I’m not even a big fan of this type of salad. Personally I would opt for canned chickpeas and kidney beans. It’s just so much easier and faster. 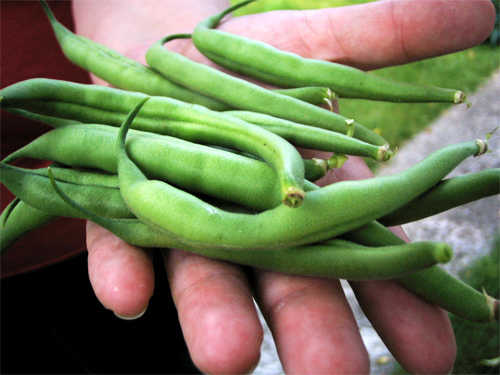 But don’t use canned green beans – blanch fresh ones. You won’t be happy with the result. 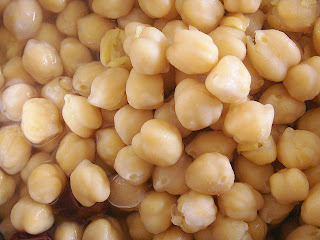 Yuck… If using dried chickpeas they would have to be soaked and boiled, of course. In case you don’t know, blanching is boiling vegetables in salted water for a few minutes. It partially cooks them but they are still crisp. It also helps them retain their fresh-picked colour. Vegetables are routinely blanched before being frozen. Keep that in the back of your mind to preserve from this coming harvest season. 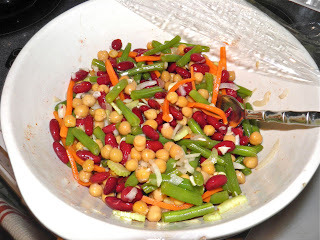 Most bean salads call for chickpeas (garbanzos), kidney beans and fresh green beans. That way you have white, red and green (the Italian flag, although I don’t think there’s supposed to be any correlation). In my recipe I also added orange in the form of carrots. Radishes, green onions, yellow beans are all potential contenders for inclusion. 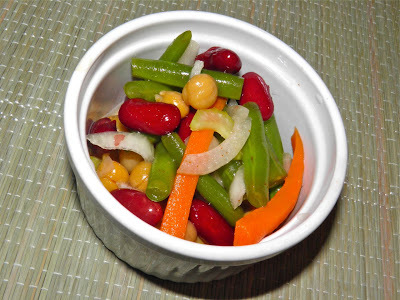 Bean salad is an excellent dish to serve if you have vegetarian friends. The beans are full of dietary fibre, protein, and contain several essential vitamins and minerals. So except for the sugar it’s not a bad thing to serve. It can serve as the main dish for those so inclined. Three bean salad also seems to go a long way. The amounts in the recipe would easily serve eight folks as a side dish and I could imagine going even further. This is a fairly big bowl. I would imagine this would servre eight easily.